Most art in the last fifty, or even one hundred years, has lost its beauty, particularly sacred beauty, and in response Christians have abandoned the arts. 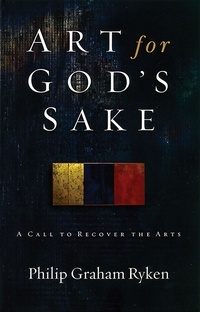 In Art for God’s Sake, Philip Graham Ryken makes a case for both the calling of Christian artists as a ministry and for Christians as supporters of the arts. In the spirit of Francis Schaeffer, Ryken makes a worthy defense of the rich variety of arts, and encourages believers to recapture that which elevates the Lord. He defines worthy art as good, true, and beautiful, the last being somewhat subjective. The book is brief, only 58 pages, and has a helpful section that follows with suggestions for further reading. And Ryken’s writing is conversational, making it something anyone would enjoy. Highly recommended.